← Trout – Do they have a preference for water temperature or oxygenated water? 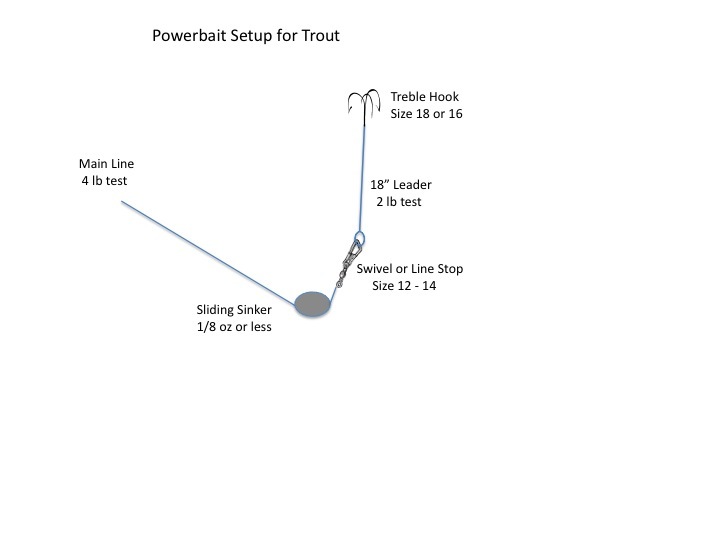 Pictured below is the basic Powerbait (PB) fishing setup that I normally start with. Most of the time I just put just enough powerbait to cover the treble hook in a ball shape. I’ll get more into PB shapes and tweaks in future post. Normally, I start with Rainbow PB with glitter and then next I’ll try Chartreuse (Green). Those two colors are responsible for 70% of the trout I’ve caught. Other go to colors for me are Lemon and Lime Twist. Also, I often will put on a small Jet Puffed marshmallow or Velvetta cheese as sometimes they are the ticket and will outfish PB. If I’m still not getting many or no bites, I’ll start adjusting the length of the leader. Sometimes the trout will only hit on a 6″ leader and other times will only bite on a 20″ leader. Leader length is very important which is why I change it up. I swear Mr. Trout can be more finicky than a kid or spoiled cat. This entry was posted in Trout Fishing and tagged power bait setup for trout, Powerbait setup, trout bait setup, trout basic setup, trout fishing. Bookmark the permalink.